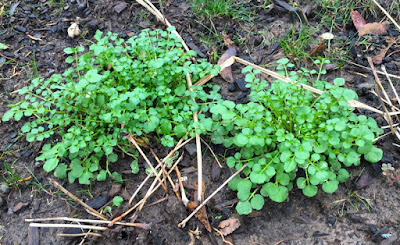 Good Stuff NW: Need Winter Greens? Check Your Sidewalk! It's the time of year when I'm longing for the appearance of spring greens like fiddleheads, nettles, miner's lettuce and the various sprouts of cruciferous vegetables known as raab or rabe. After all, on my dog walks through the neighborhood I'm seeing the first shoots of daffodils poking up through the dead leaves from last fall, and my daphne is already sporting pink heads of the blossoms that will be perfuming my front walk in short order. Now my friend Katherine Deumling of Cook With What You Have has just reminded me that a great source of fresh greens is to be found by simply stepping out my front door. Better yet, they're free! 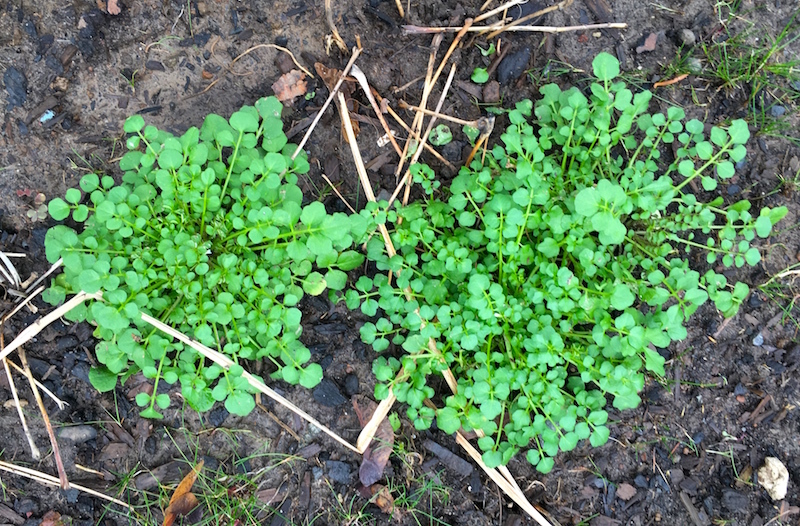 Hairy bittercress, aka Cardamine hirsuta, is a member of the mustard family with the same peppery bite as its leafier cousins. 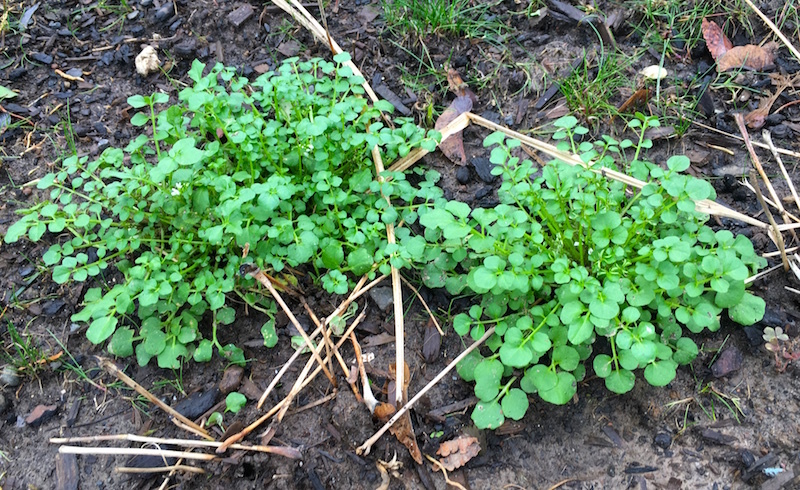 The bane of gardeners and farmers alike, it can take over a raised bed in no time when its seed heads explode, giving it the moniker, or rather the much-cursed name, of pop weed. A quick sweep around the yard revealed tons of the little buggers coming up in all the garden beds, with some more mature clumps like the ones above hanging out on some freshly turned flower beds. To use in cooking, look for them in places you're sure haven't been sprayed with chemicals, and that are out of the reach of dogs who may have a yen to mark the spot for some reason. Bring them in, rinse them off and chop at will. Katherine recommends using them in deviled eggs, and says they're also terrific added to a salad, a sandwich or a quesadilla for a mustardy zing.